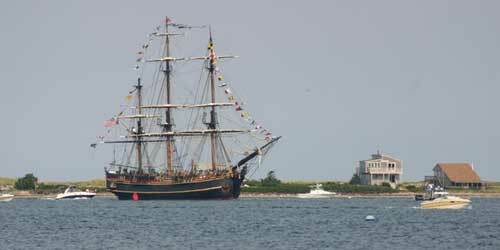 Massachusetts has welcomed families since the first one landed at Plymouth. Any time of the year, you’ll find family friendly lodging, activities, and adventures on day trips, weekend getaways, and longer vacations. Enjoy a full menu from museums to indoor and outdoor amusement parks and water parks, beaches , zoos and ziplines, whitewater rafting and kayaking, and the largest family go cart track in New England. 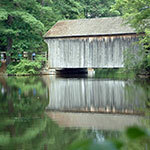 The most complete set of early American historic sites are here with tales to tell and there are great beaches and endless scenic places to stop, relax, and snap some pictures. 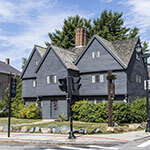 Click Here for Family Friendly Lodgings in Massachusetts. 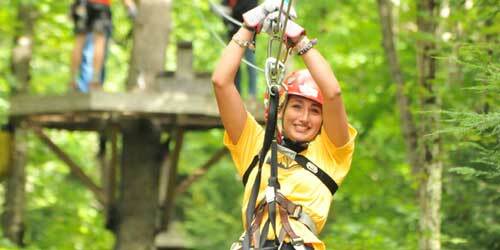 It's hard to imagine that you and the kids would not have a blast at Zoar Outdoor. For starters, look at all the things you can do: fly through the trees on a zip line canopy tour that gets up to 50 feet above the forest floor; go for an easy float or face whitewater rapids with a rafting tour; or rent a stand-up paddleboard or kayak and paddle down a river or around a lake. At the Zoar center in Wilmington, you can go mountain-biking or, in the winter, snowshoeing or skiing. Where to stay? Try our Hawk Mountain Lodge in the Berkshires, a renovated farmhouse suitable for up to 14 people. Want something more rustic? We have five tent sites, 11 cabin tents – and a yurt! – in our campgrounds surrounded by 80 acres of breathtaking wilderness where the kids can see hawks, owls and deer. This family owned destination in Tewksbury offers the area’s best bowling, restaurant, golf simulator, and event space for any occasion. A fun, positive, family-friendly destination, it offers high quality, year-round entertainment for kids to seniors and for casual and league bowlers. Enjoy luxury candlepin and ten pin lanes with big screens, music videos, sporting events, and comfortable seating areas at each lane. The world class redemption arcade features over 60 of the most popular games in the industry and an upscale prize redemption center with electronics, games, novelty items, stuffed animals and more. Celebrations of every kind are welcome for groups of 10 to 400. There’s great food at the Firewater tavern plus weeknight and weekend specials. Check it out. Lions and lemurs and birds - Oh My! Get your family up close to some of the worlds’ most interesting animals. 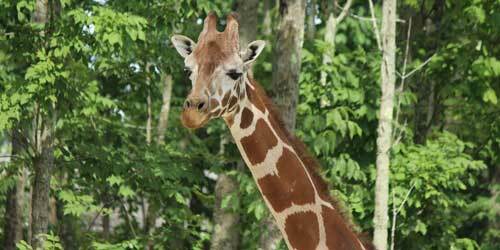 Boston’s largest park on seventy-two acres brings you lions, giraffes, and zebras in their own special habitats. You’ll find gorillas, lemurs, sloth and other friendly beasts in the Tropical Forest and experience a free-flight bird adventure at the Aussie Aviary, open seasonally. Kids will find programs that are fun and educational, the Zoo Camp, and Snorin’ Roarin’ sleepovers. Plan a birthday party or other event at the unique indoor and outdoor facilities. The Things Wild Gift Shoppe has souvenir items, toys, games, and apparel and the indoor Giddy-Up Grill and Kalahari Kitchen offer southwestern-themed food for all to enjoy. The sky’s the limit for visitors to the W. Russell Blake Planetarium, the only 4K full-dome planetarium south of Boston. As you sit back in angled chairs, you’ll gaze at a ceiling filled with stars and planets while learning to identify them and how to use a star map (that you can take home). Activities for kids include “One World, One Sky: Big Bird’s Adventure,” which follows the Muppets as they explore the night sky. It’s a spectacle of light and color not to be missed. Afterward, children can draw the constellations. 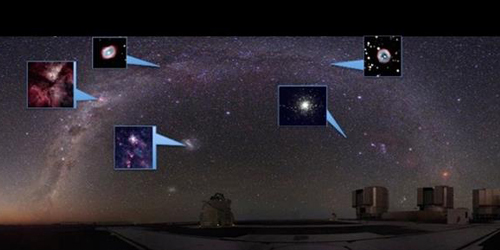 Regular seasonal stargazing programs include “Habitat Earth” and “Astronomy 101,” taking advantage of the high-tech surround-sound system and jaw-dropping full-dome views. Here’s a great day out for the entire family – go karts on tracks designed with everyone in mind. The longest Family Track in New England gets you revved up through speedy straight-aways, hairpin curves and tunnels and two of you can now ride the new two-seater go-karts. The Slick Track will test your mettle, and there’s a new Rookie Track for the youngest and Kiddy Track and Beginner Track as they grow - so there’s never a time not to be driving your own cart. 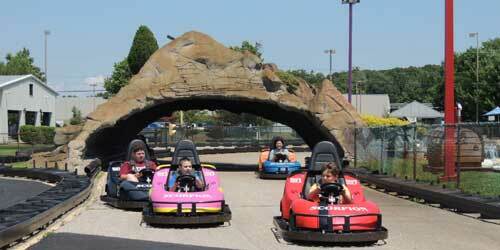 Bumper cars and boats stretch the envelope of fun and you can take on the family in a friendly game of mini golf. 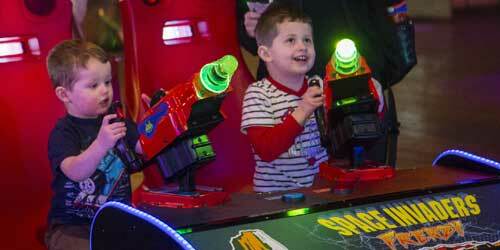 Rain or shine enjoy more than 60 of your favorite arcade games. 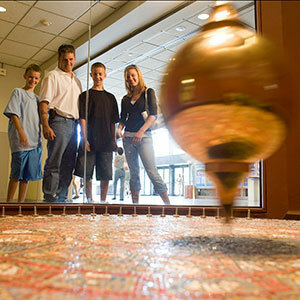 There is great family fun and creative magic at the Fitchburg Art Museum. FAM present galleries filled with antiquities from Egypt, Greece and Rome, Africa and 19th century New England. Take a journey across time and you’ll discover sculptures, everyday objects, realistic reproductions of tomb walls, and even a mummy. Intriguing Learning Lounges feature interactive spaces where you can listen to an artist describe her own process, create your own art project, or contribute to a communal art work. Bring a sketch pad and pencils, and let draw your reactions to the art you see. Check out the exhibitions of art from schools, community organizations, and local artist groups in the Community Gallery and even show something that you’ve created. 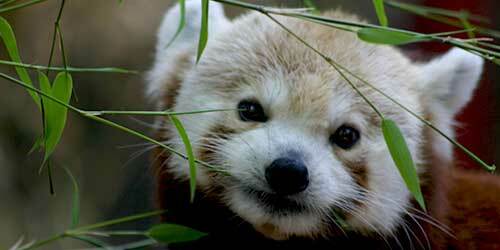 New England’s largest zoo is now open with an all new prairie dog digs, two toed sloths and cheetahs. 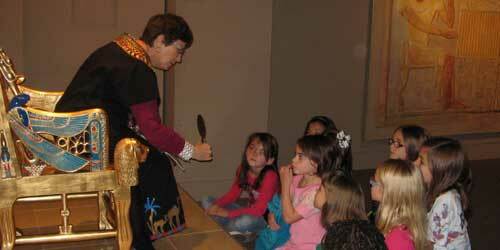 Learn about your favorite animals at the Earth Discovery Center. You’ll find 115 species of animals large and small on foot, from the Woodlands Express train ride or high above on the Skyfari Sky Ride, Meet elk, native birds, painted turtles and toads, Step into the 35 acre deer forest, ride over the playful chimpanzees, stately camels, scary alligators, colorful zebra and ostrich. Enjoy a day’s worth of shows, animal encounters, a petting zoo, parakeet aviary and animal exhibits to take your breath away with big cats, white rhino, snakes, dragons, and WATCH OUT - the popular Madagascar Hissing Cockroach. Always free parking and handicap accessible. Wet, whacky, wild family fun! 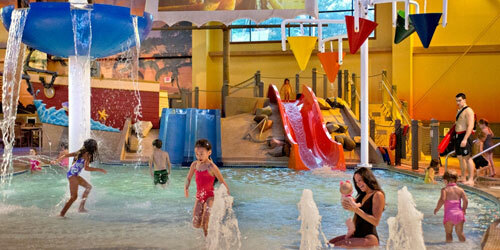 Make a splash with the family at the largest indoor water park in Massachusetts. A tropical indoor paradise where it’s always 84 degrees and open every day for every kid of every age. There are water slides, a lazy river, a splash pad and dip-in-the- theater arcade, private cozy cabanas, and lots more. Hold one of a kind birthday parties, group swims, or even buy out the whole park for a day. Then enjoy a night at the Doubletree Hotel Boston North Shore adjacent to the Park with luxurious bedding and jumbo pillows, flat screen television, on-demand movies and premium cable channels. Look for Coco Key Discounts and packages that include overnight accommodations, water resort access, and breakfast in the family-friendly TradeWinds Restaurant. Families in New England weren’t so different 200 years ago, yet the lives they lived were very different. How they worked and made a living, fed and cared for themselves and each other, raised children and planned for the future. 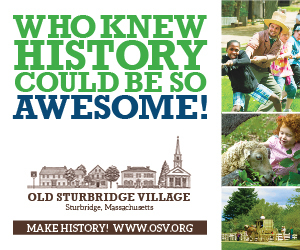 Their story is preserved here in one of America’s largest and most celebrated living history museums with 40 antique homes, buildings and water-powered mills from the 1800’s. 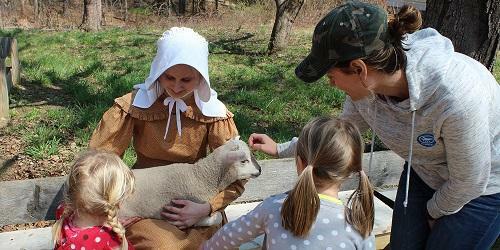 You and your family can experience that time again on an early stagecoach ride, up close to old breeds of farm animals, in a chat with a costumed interpreter, and under the watchful eye of an experienced blacksmith, cooper, potter, or farmer doing what he did then. 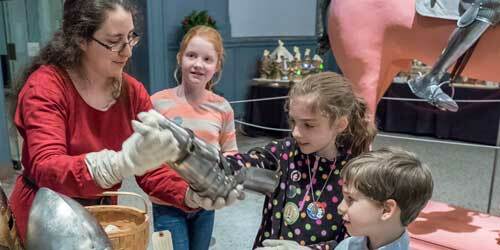 Over 30 special weekend events with hands-on craft work and more offered daily. Arcades have been an entertainment choice for kids and families for generations and no wonder. Fun World has the formula covered. There's lots of physical activity for younger kids in a huge, multi-level playground with big slides and a ball pit, along with 30 tot rides. For older kids and teens, the blur of choices of arcade games is daunting, from Wave Motion Theater and six-player Galaxian Theater to sports games, dance games to classic air hockey and pinball. Tickets can be redeemed for prizes hundreds of prizes. 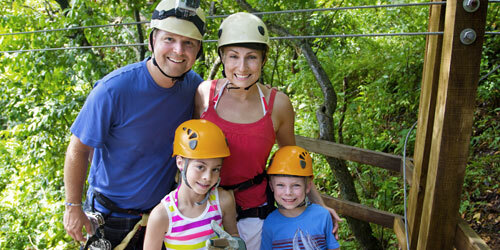 Parents will appreciate the reasonable price for a full day for family fun. Naturally, Fun World sells pizza and other classic kid foods, so your gang can hunker here ’til everyone is too tired to move. 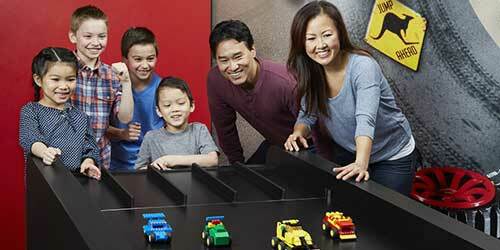 Families love LEGOLAND Discovery Center Boston with its 4D cinema, Kingdom Quest laser ride, Merlin’s Apprentice, and the fabulous LEGO City Play Zone. You’ll find a spacious family restroom, full baby changing facilities, plus wheelchair and stroller accessibility throughout. Have your child make up a story about their LEGO® creations. Challenge them to a timed build – give them a set number of bricks and a time limit and see what they create. Have fun playing a brick building game together then display your creations on your own colorful LEGO podium or share a photo on LEGOLAND Discovery Center Boston’s Facebook page. There’s a delicious coffee shop and the amazing LEGO Retail Shop with the latest LEGO® products plus exclusive limited edition items. A compelling approach to history; a memorable visitor experience. 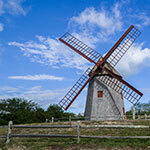 Plimoth Plantation is a world-class living history museum overlooking Cape Cod Bay. This immersive museum features costumed interpreters and modern day artisans throughout our award-winning exhibits, including the 17th Century English Village, Wampanoag Homesite, Plimoth Grist Mill and Mayflower II docked in picturesque Plymouth Harbor. Plimoth Plantation's hands-on, entertaining brand of living history is what has earned the museum it's reputation for delivering powerful personal experiences to guests of all ages from all over the world. 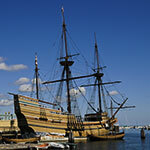 Please allow at least 3 hours to visit to Plimoth Plantation and about 45 minutes for Mayflower II. 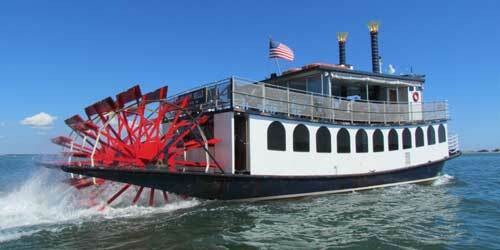 From the home of one of the nation’s first families, the city of Quincy offers your family a variety of activities from which to plan a day outing or a long vacation. 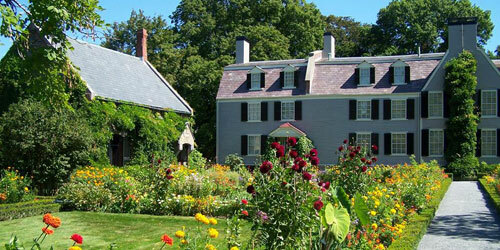 Take the trolley trip at Adams National Historical Park to see the home of John and John Quincy Adams, and the nation’s first presidential library, boat over to Boston Harbor Islands National Park, sunbathe at Wollaston Beach (or one of 10 other city beaches), fish from a pier or just relax at one of 52 parks, many with playgrounds, picnic areas and ball fields. Enjoy autumn colors strolling marsh-side and riverside trails. In the winter, go ice skating or try skiing or snow-shoeing at Blue Hills Reservation. This wonderful family place started as a small local attraction in 1905 with elephants, giraffes, zebras, pigmy hippopotami and sea lions. 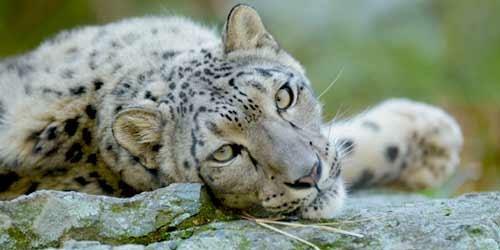 Today discover fascinating animals from around the world. Greater Boston’s only white-cheeked gibbon exhibit is here, home to monkeys, lynxes, snow leopards, Mexican gray wolves, river otters, a black bear and the mysterious capybara. See jaguars, cougars, coyotes, and Gila monsters at the Treasures of the Sierra Madre exhibit. Windows to the Wild offers macaws, flamingos, sloth and meerkat. Meet “Major,“ the polar bear that inspired the Zoo’s popular black bear exhibit. The Peacock Place Gift Shop has unique gifts and souvenirs while the Safari Grill offers kid-friendly food and there are plenty of outdoor tables where to enjoy your own picnic. 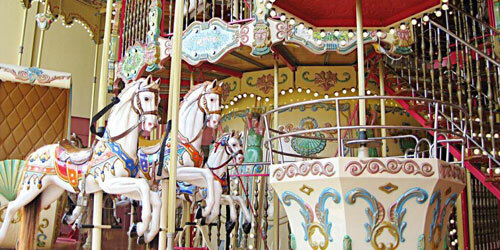 The whole family is well cared for at this historic fun park just 30 miles north of Boston. Start with 85 rides, indoor-outdoor games and an arcade, plus live entertainment on two stages and the Dance Hall Theater, special events and a dedicated Kiddieland area, and everyone will get involved and smile. A wide variety of delicious food is yours and available around the park in 20 great spots, while plenty of tax free shopping at numerous gift shops lets you fill up on souvenirs, keepsakes and more. There’s an ATM, lockers, available services for expectant mothers, and accommodations for all ages and physical abilities. Bring your own or rent a wheelchair, electric scooter stroller or double seat stroller. Canobie Lake Park was ranked as one of the 2018 top ten amusement parks in the U.S. by Time’s Money Magazine. 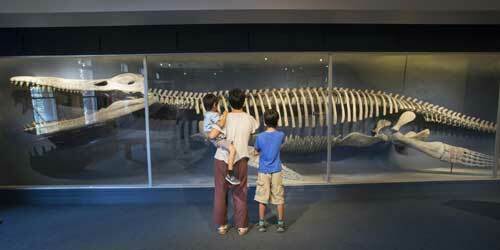 For families, it’s hard to beat the 16 galleries in this museum displaying 500 taxidermy animals -- full-size elephant, rhino, hippo, tiger, bison, even a 15-foot giraffe -- not to mention huge whale skeletons. Don’t miss the skull of one of the first Triceratops ever discovered and the world’s only mounted skeleton of the 42 ft.-long Kronosaurus. Explore a timeline of Earth’s history, and admire 3,000 rare minerals and gemstones. Touch a meteorite from outer space. New and changing multi-media exhibitions showcase cutting-edge research. 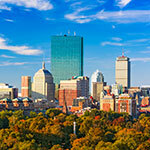 The museum is an easy 8-minute walk across the historic Harvard campus from Harvard Square with its popular shops and restaurants and MBTA station. The museum is connected to Harvard’s Peabody Museum, and one admission fee covers both museums. Here’s a great indoor physical activity for the whole family at Jordan’s BeanStalk™ Adventure Ropes Course in Reading Massachusetts. Enjoy the challenge of traveling from one activity to the next testing your agility and balance. 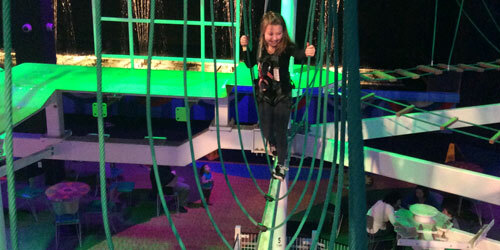 Climb to 12 or 24 feet and make your way across the sky ropes course onto zig zag beams, crisscross angled rope ladders, and then hold on to spaghetti hand lines. Walk the plank at 24 feet then travel out on a 6 inch standalone beam, pivot and return. You’ll find two levels of challenging ropes course, 30 exciting activities and for young adventurers, there’s BeanSprout™, a specially designed course for children 2-7. Adventurers must be 48" tall or 42" if accompanied by a chaperone. For family adventure, fun and education it’s hard to beat this amazing museum. With exciting interactive programs, events and more for every age, the WAM offers a look into the extraordinary breadth of human creativity and showcases the world’s art treasures from ancient times to modern days. You’ll discover paintings by Cassatt, Gauguin, Goya, Monet, Sargent, and Homer; floor mosaics from the ancient city of Antioch; and stand face to visor with knights in armor. Kids will love getting creative in Helmutt’s Drop-in Studio. Take a guided tour or a live drawing class. Enjoy lunch at the Museum Café, and shop for unique gifts and mementos. WAM is considered one of the finest mid-sized museums in the country. For exhibitions and program schedules, follow our link above to our website. Jiminy Peak Mountain Resort offers lodging accommodations perfect for any family Berkshire getaway. Choose from our Country Inn Suites or two or three bedroom mountainside Vacation Homes. We offer a host of amenities to make you feel at home, including shopping and dining in the Village Center and Country Inn, outdoor heated swimming pool, fitness room, game room and more. During your stay enjoy some outdoor summer fun at our Mountain Adventure featuring 2 Parks in 1 location – Mountain Adventure Park and Aerial Adventure Park as well as the Soaring Eagle Zip Ride and Mountain Segway Tours. Enjoy the convenience of our New England Country Inn, a beautiful, spacious all-suite hotel located at the base of Jiminy Peak Mountain Resort. History is just the beginning! 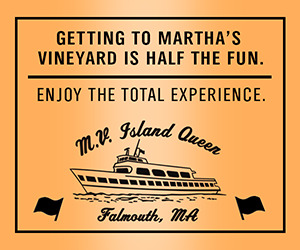 Bring the whole family to Plymouth, MA for some unforgettable fun! Adults and children alike will be able to enjoy their visit to Plymouth with a wide variety of activities on land or on the water. The Atlantic Ocean itself is a playground, and trips such as whale watches, lobster excursions and pirate adventures have proven popular with visitors both young and not quite as young. 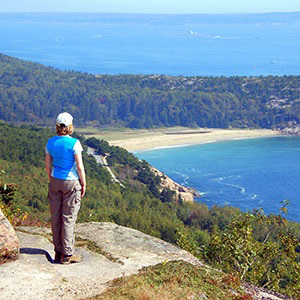 Our beaches and parks offer families a place to relax and enjoy the great outdoors. Edaville USA is open year-round and features a restored narrow gauge train ride through acres of cranberry bogs, and Plimoth Plantation provides a living history museum depicting life in Plymouth in 1627. Please call 1.800.USA.1620, or visit our website to learn more about these activities and others to prepare for your trip to Plymouth. For families it's easy - bring your kids and play! There’s lots to do. Where do you want to start? Depends on the season. How about skiing or boarding or tubing, zip lines, white water rafting, or downhill mountain biking? 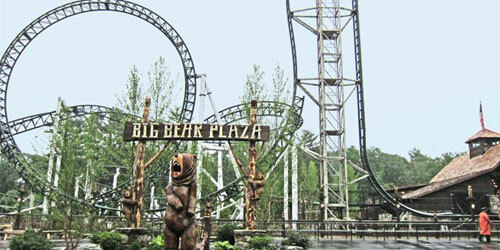 Come check out and ride North America’s longest mountain coaster! We offer lessons and equipment rentals. We have a great family friendly place to stay right here while you’re enjoying all of the activities, the Crazy Horse Bar and Grill for lunch or dinner, a friendly staff and a commitment to being the best at whatever we do. We are just 2 hours from Boston, three hours from New York City. 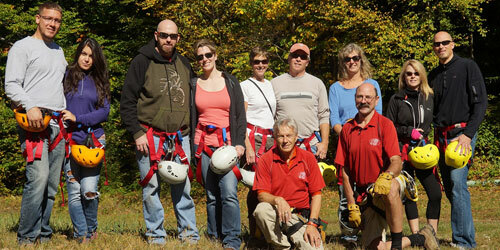 Crab Apple ran the first ever raft trips in 1989 on the dam controlled Deerfield River. The excitement continues on a wide range of full day and half day trips. 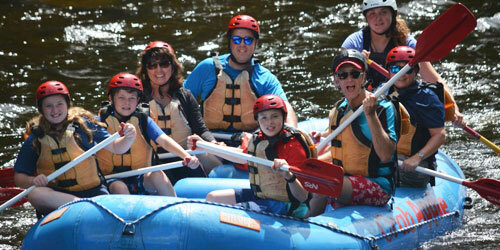 Kids 8 and up can enjoy rafting trips on mild Class 1-3 rapids, teens on more aggressive Class 3-4 rapids, and those age 5 and up will have a great fun time in guided rafts or inflatable kayaks on mild whitewater. The guides are great with kids of all ages and help rafters explore the Deerfield sharing information about local history, wildlife and hydrology along the way. There’s great food, hospitality and service, the best equipment, and riverside base camps with the comforts and convenience to make your rafting adventure one that you’ll never forget. With rolling mountains and forests, winding rivers and sparkling lakes, and scenic back roads that pass by fields and farmland, the stage is set for the world-class music, art, and theater that are the main attraction of summer in the Berkshires and the ideal location to bring the whole family. Locally grown foods are fresh and plentiful this time of year, the ingredients for the creative culinary treats that await you at breakfast, lunch, dinner, or a picnic under the stars. A great way to spend time as a family is to get outside and the Berkshires has what you are looking for, from mountains and forests filled with hiking trails, swimming and kayaking fun plus a variety of aerial adventure parks. 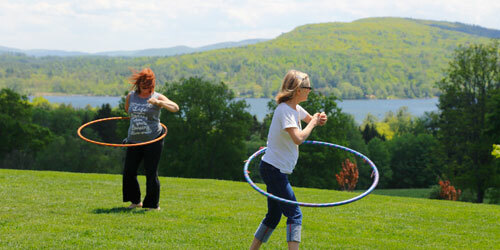 Pack up the family and get in some quality time this summer in the Berkshires. 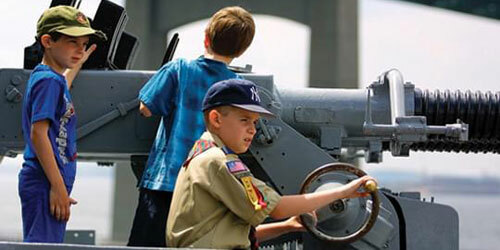 America’s naval history inspires the whole family at this world class heritage museum in Fall River. Explore the world's largest collection of US naval ships including the mighty USS Massachusetts, the destroyer USS Joseph P. Kennedy, Jr., and PT Boats used in the South Pacific. The sheer size and impression these ships and their stories leave is overwhelming. There’s the state-of-the-art special effects Pearl Harbor Experience, the only outdoor multimedia reenactment anywhere. Scouts and youth groups can participate in a year round maritime camping program, overnights, and family nautical nights with affordable camping on site. 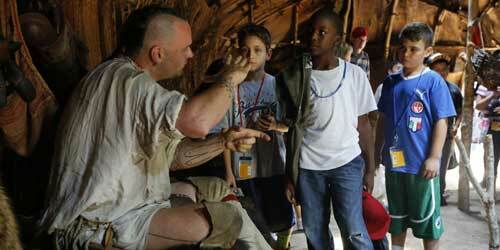 Whether a casual visitor, history buff, student, teacher or scout leader, everyone learns. Special exhibits honor our men and women in uniform then and now.